HSP60 antibody LS-C15681 is an unconjugated mouse monoclonal antibody to HSP60 (HSPD1) from human, mouse, rat and other species. Validated for IF, IHC, IP and WB. HSPD1 / HSP60 antibody was raised against recombinant HSP60 protein. Recognizes only the mammalian hsp60 at 60kD. Does not recognize bacterial hsp60. Epitope maps between aa383-447 of human hsp60. Species cross-reactivity: human, mouse, rat, hamster and chicken. Does not react with bacteria, helminths or spinach. 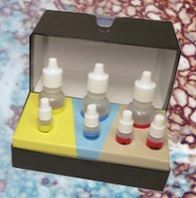 Suitable for use in Electron Microscopy, Immunofluorescence, Immunoprecipitation, Western Blot and Immunohistochemistry. Immunoprecipitation (Native): 2 ug/mg protein lysate using Protein G. Western Blot: 1-2 ug/ml for 2 hrs at RT. Immunohistochemistry (Formalin/paraffin): 1:50 for 30 minutes at RT. Note: Staining of formalin-fixed tissues requires boiling tissue sections in 10 mM citrate buffer, pH 6.0 for 10-20 minutes followed by cooling at RT for 20 minutes. Positive control: BT474 cells, MAD109 cells and breast carcinoma.